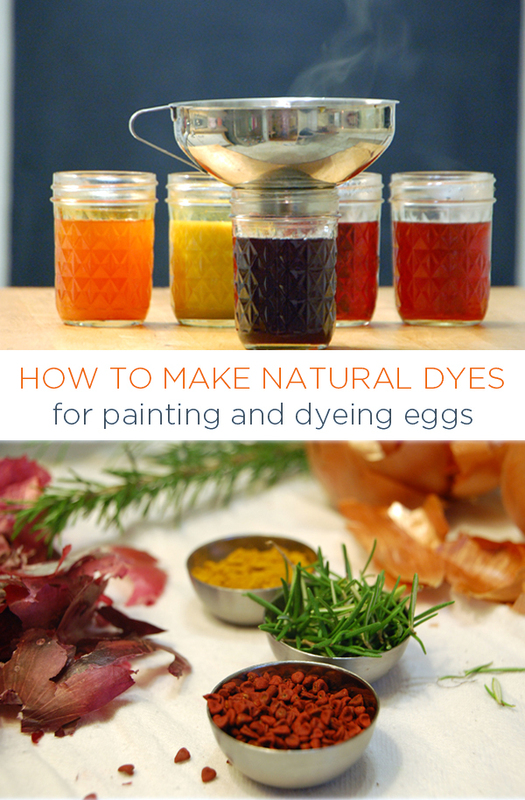 Today I’m sharing my favorite recipes for making homemade DIY all-natural dye for painting and egg decorating. While these dyes take a bit more time than their store-bought cousins, they are easy to make and definitely worth a try. 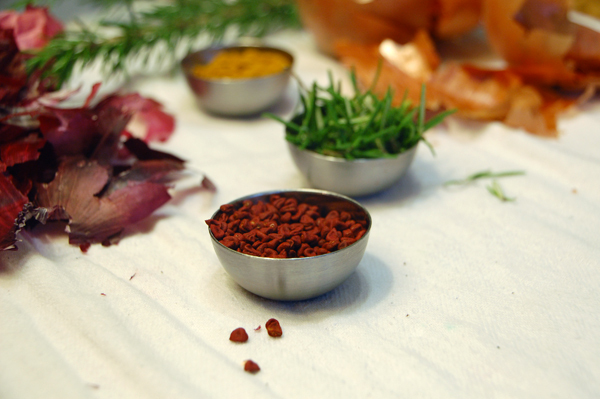 The dyes are 100% non-toxic and are, therefore, food-safe. You can eat those eggs with peace of mind. 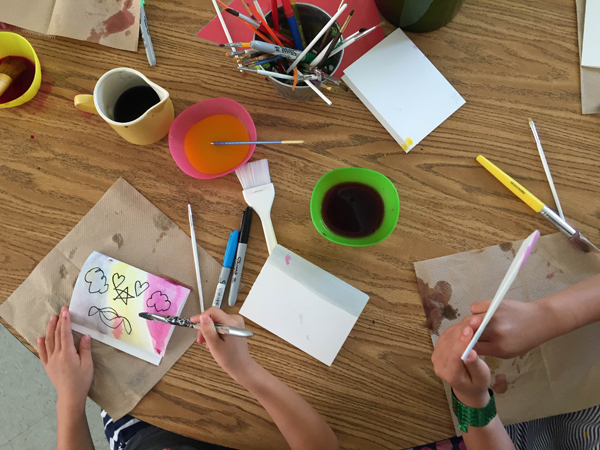 Making your own dye teaches children to be resourceful. You don’t have to go to the art store for paint when you can make your own from things you have in the fridge. I’ll share five recipes below, and will refer to these as “egg dyes,” but understand that these can also be used as watercolor paint. We’ll add a bit of vinegar to each recipe. Vinegar will act as a mordant, which means that it will help the dye stick to the paper or egg, and keep it from fading quickly. Bring ingredients to a boil, and then simmer for 20 minutes. Strain the dye into a container. Bring ingredients to a boil, and then simmer for 15 minutes. Pour the dye into a container. This dye will be a bit pasty, as it retains some of the thickness of the spice. Bring ingredients to a boil, and then simmer for 15 minutes. Strain the dye into a container. Note: Annatto seeds temporarily stained my pot. It did not change the flavor of food cooked in the pot and the stain cleaned away after four cleanings. Bring ingredients to a boil, and then simmer for 30 minutes. 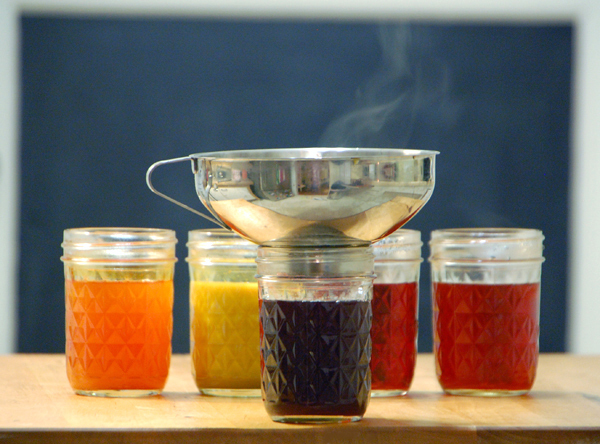 Strain the dye into a container through a sieve. Press the berries to pull as much juice out as possible. Bring the first three ingredients to a boil, and then simmer for 15 minutes. Strain the dye into a container. 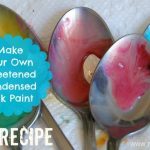 If your dye is not blue, as it is in this post, you can add baking soda to the dye and it will change color from purple to blue. Add more baking soda to intensify the color. Science behind this color change: Red cabbage contains anthocyanin, a pigment that will appear red, purple, or blue depending on the pH. When you add acid, such as lemon juice, to an anthocyanin, it will become pink. And when you add a base like baking soda it turns blue! 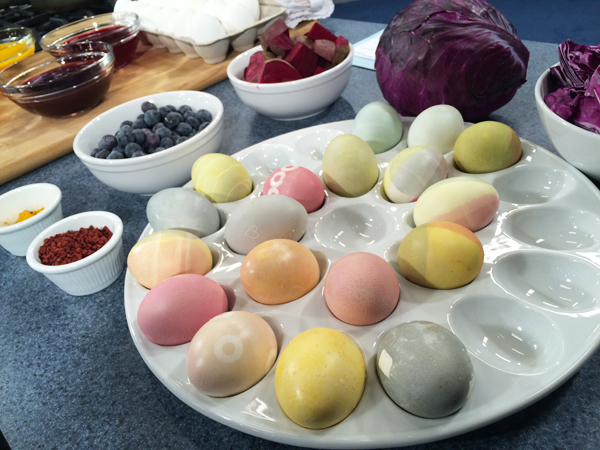 Hot or cool, your dyes are now ready for eggs! 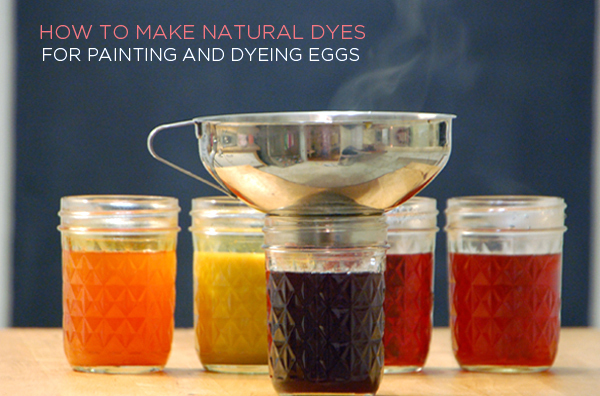 These dyes take a bit of time to brighten up an egg – give yourself between five and 20 minutes, depending on the intensity of color that you’d like to achieve. 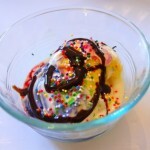 Try mixing colors: How can you get orange dye? Will it work to dip the egg in yellow first, and then in red. Or vice versa? 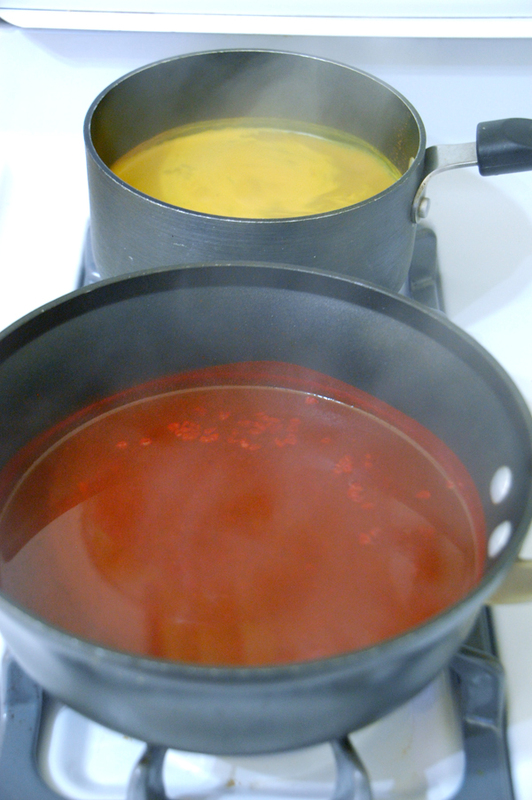 Fill shallow bowls with a small amount of the dye. Dip on side in red, then another side in blue, and so on. 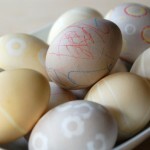 Draw on the egg with white crayon. This will act as a resist. Then dip the egg in dye. Cover the egg with stickers. Dip in dye. Dry and remove stickers. 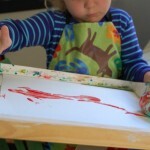 And finally, you can paint with this dye just as you would watercolors. 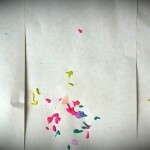 Yesterday I took our dyes to my daughter’s class. 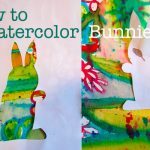 We drew on watercolor paper with Sharpie markers (affiliate) and then painted over it with the natural dye. I also took time to ask the children if they wanted to smell the dyes, and there were lots of scrunched up faces! 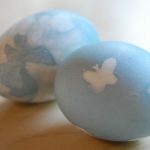 To see more ideas like this, read the predecessor to this post: Vegetable-Dyed Easter Eggs. 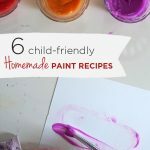 This post, Our Favorite Homemade Paint Recipes, contains seven favorite recipes. 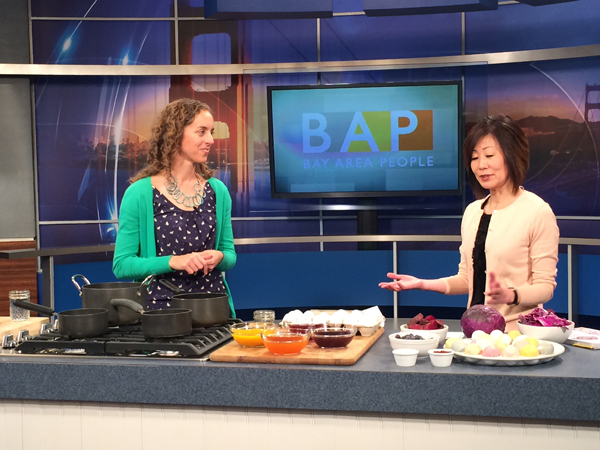 You don’t want to miss these easy, healthy recipes.